Only 10 minutes on a London road shows that we aren't a group at all. Some of us are fast, some slow. Some wear helmets, some don't. Some break all the rules, some break none. If employers really want to know what prospective employees are like, they should forget psychometric testing and watch them ride a bike. Some cyclists may protest that they are aggressive in the saddle only to become pussycats at their desks, but I don't agree - on a bike you are close to death and so become a more intense version of your true self. After I left the banker and proceeded to work, I saw three other cyclists showing traits that should have interested their HR departments. The first had his right trouser leg rolled up to reveal a meaty calf. Such resourcefulness in the absence of a clip impressed me - I'd hire him as a problem solver. The next was a man balancing, stationary on a fixed gear bike at the lights - no-one likes working with a show-off. And then there was a woman on a baby-pink Brompton bicycle going through a red light just by St Paul's Cathedral forcing pedestrians to step out of her way. Clearly, it is the red light that is the richest point for data gathering. This woman comprehensively failed the job test. The two-wheel test also weeds out those who are not team players. 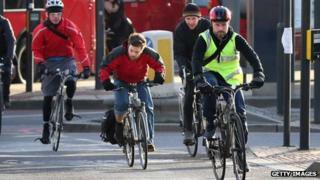 All cyclists view cars, lorries and buses as natural enemies, but the cyclist who is hostile to his own kind, and who squeezes past others on the inside is suitable only for solitary working. Not only does cycling show how competitive someone is, it shows how men feel about women being faster than them. On the - increasingly rare - occasions when I overtake a man on a bike, he almost always overtakes me back at once, just to make the point. It is not just the behaviour on the bike, it is the bike itself. The person with the carbon racer wants to impress. The person on the hybrid just wants to get the job done. The not terribly fit man in Lycra is all talk, no trousers. So what does my cycling style show? That I like being in control. That I'm cavalier about some rules and fairly selfish, but try not to be flagrantly obnoxious. I wear a helmet, a nasty fluorescent tabard and high heels - but to prevent any more pairs being destroyed by the pedals I have invented a heel condom made out of an old inner tube. Which shows I can be creative - but only when really desperate. Lucy Kellaway is an author and Financial Times columnist. Listen to her on Business Daily and World Business Report on BBC World Service every Monday.